A note about this review – I’m reviewing a vintage (nearly 70 year old) original version of a proposed Kickstarter project. Having said that the Kickstarter project aims to exactly replicate the design and workmanship of this original. I became aware of the Eagle Cap-Off when I was involved in a slew of Twitter mentions [HBF on Twitter] on the subject. 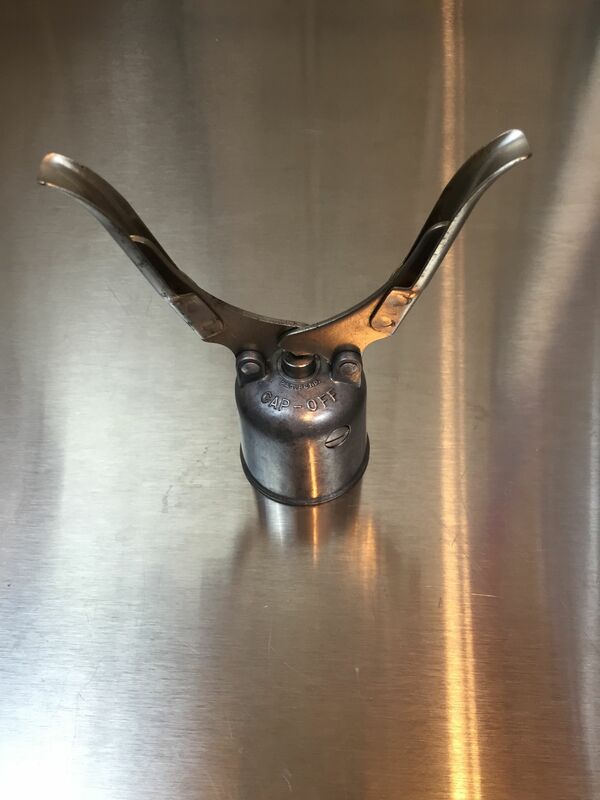 The Eagle Cap-Off Kickstarter aims to raise funds to revive an American made mechanical bottle cap remover that was manufactured nearly 70 years ago. The re-launch of Eagle Lock Company’s Cap-Off will feature the same high quality construction and materials and it will continue to be made in America. After posting about this, I think the folks behind it sensed my excitement for the idea. 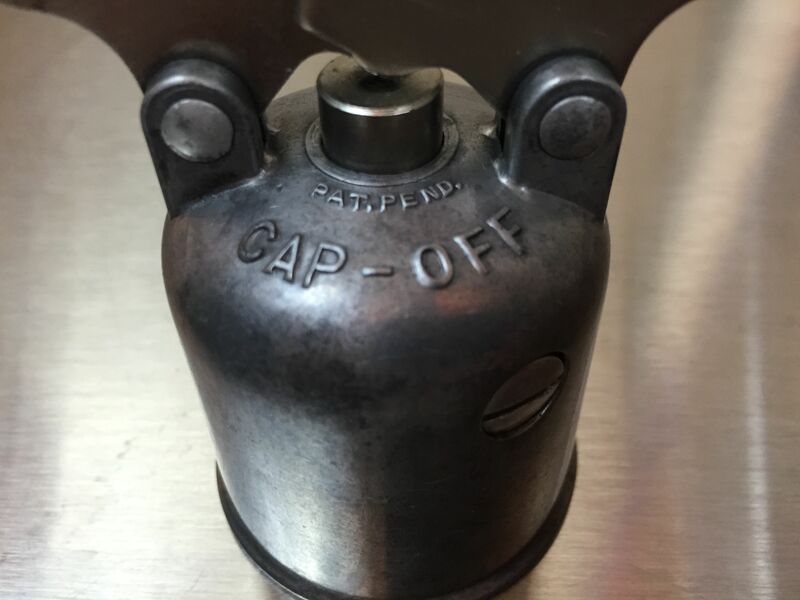 As a result… they sent me a vintage example of the Eagle Cap-Off! Thank you to Mike and Matt for sending this my way! A look at the top of what I’ll call the “bell” of the Cap-Off. It reads Pat.Pend. CAP-OFF. Top down view. Click to enlarge. A look inside the opener. 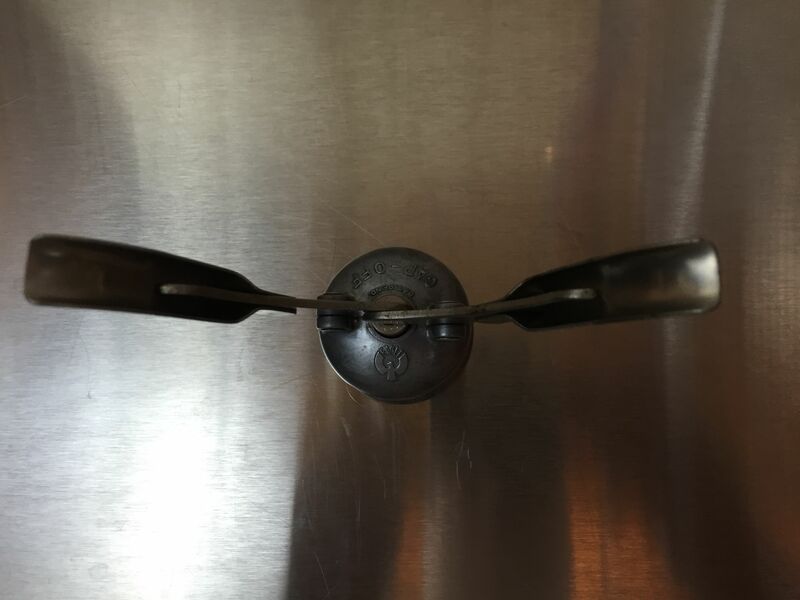 When you squeeze the opener the 3 arms contract to hold the cap in place. At the same time the center part pushes down. That motion easily removes the cap. No bending or twisting motion is required. Only squeezing. For size comparison. 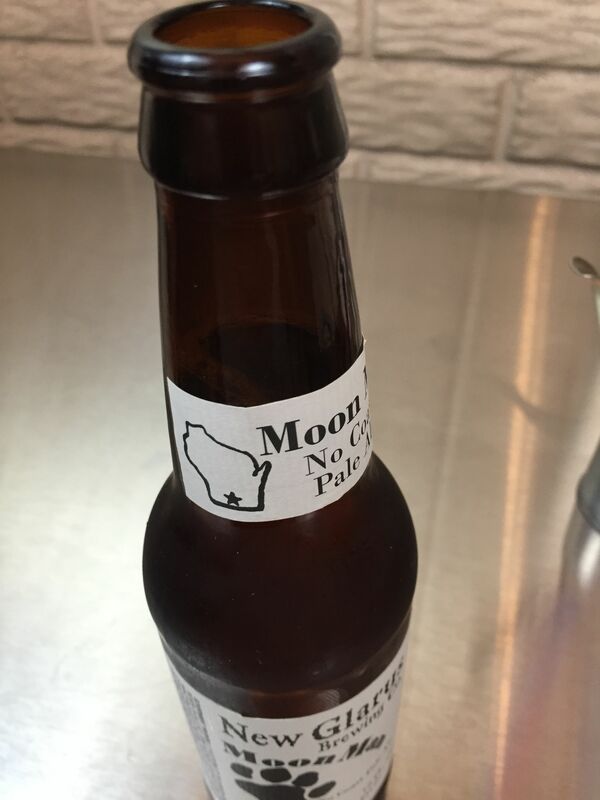 Next to a bottle of New Glarus Brewing Co’s Moon Man No Coast Pale Ale. 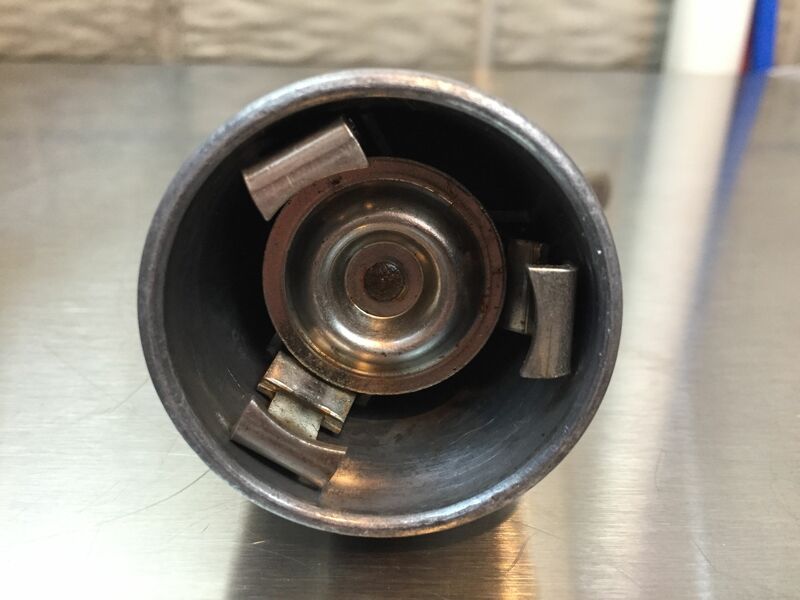 A look at the removed cap. 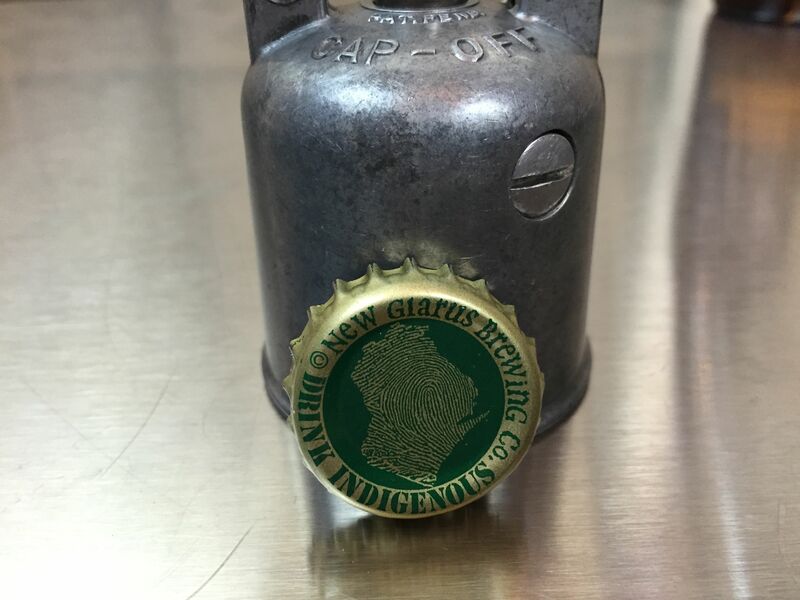 If you’re a cap collector this would be a great bottle opener for you. 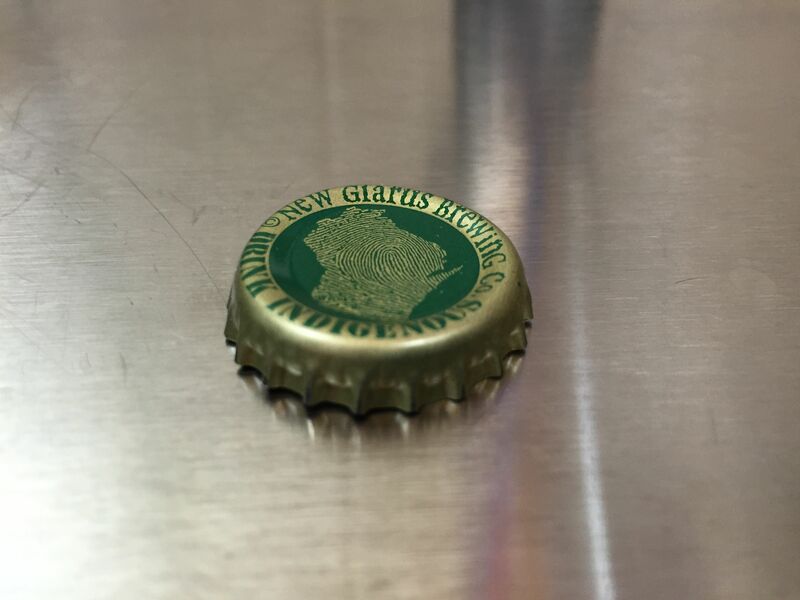 With exception of a neat circular indentation on the cap, it is left completely intact. 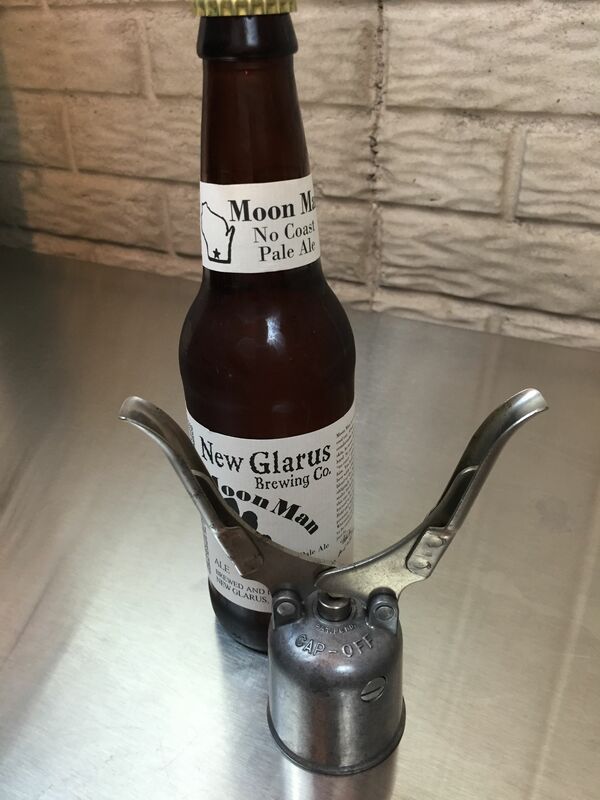 This bottle opener is (to me) beautiful. I love the utilitarian design and function. The fact that this is nearly 70 years old – floors me. It is a testament to the quality construction and design that went into this classic device. At the current reward levels, this is not a budget opener. If you’re looking for that, you’ll need to keep looking. It is however unique and well built. It appears as though the new Eagle Lock Company will meet their Kickstarter goal. I hope they do because I’d love to see this great opener hit the market. Update 1: They reached their goal! 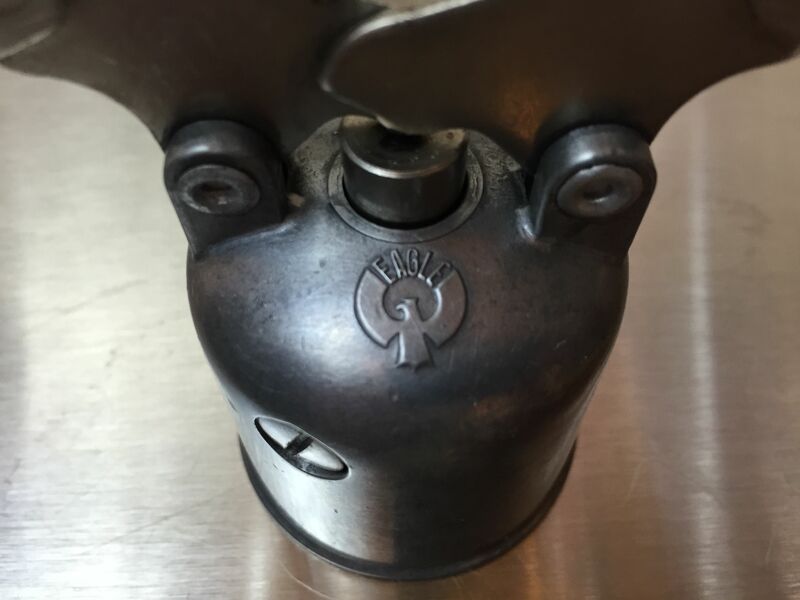 This entry was posted in Bottle Opener, Eagle Cap Off, Featured Reviews, HBF Tested, kickstarter, Made in the US, Reviews, Reviews & Top Posts on December 4, 2015 by admin.